During the troubled times of King Richard II's reign, when his uncles and their allies, the 'Lords Appellant' were trying to impose their will on the immovable King, the young monarch did loose power for a short time in the Winter of 1387-88. Thomas of Woodstock, Duke of Gloucester, the King's uncle and chief adversary, took the opportunity to accuse the Richard's favourite, Robert De Vere, Earl of Oxford, of treason. De Vere escaped to the West Midlands where he gathered together an army of some fifteen thousand men. Quickly, he marched them south to both defend himself and reinforce the King's followers in London. Gloucester immediately led troops north to close the roads from the Midlands and the King's western reinforcements, originally heading for Burford, found themselves obliged to head quickly south. Gloucester's deputy and nephew, Henry Bolingbroke, the Earl of Derby (later to become King Henry IV), had taken up a more southerly position, along with Mowbray, the Earl Marshal. They blocked off any route across the Thames by encamping on the island between the Pidnell and Radcot Bridges on the Berkshire-Oxfordshire border, near Faringdon. Bolingbroke was a cousin of De Vere's repudiated wife. He regarded him as a scoundrel and yearned to meet him in the open field. De Vere's army arrived at the twin Thames bridges, only to find the first sabotaged and the second guarded by Derby's troops. Gloucester's men were still closing in from the north. The Royalists turned and deserted at the first shock of Bolingbroke's pikes. They could only surrender or else make desperate rushes over or through the river in an attempt to escape. Mounting a fresh horse, De Vere pushed forward but, with Pidnell Bridge demolished, the terrified Earl was forced to have his mount leap into the river and face up stream. Hugging the bank, he lightened his load by dropping his gauntlets, sword and casque. At Radcot Bridge, stood a company of archers. Dodging their deadly arrows through the stream again, he sought a ford but none was to be found. As night came on, he slipped from his horse, put off his cuirass, plunged into the stream, and swimming across, escaped with the loss of everything but life and limb. Hiding in the woods by day, De Vere stole away into the western shires where, for a while, he was safe. His enemies believed him dead. Horse, casque, sword and cuirass being found next morning by the riverbank, his pursuers fancied that he had been drowned. However, he eventually managed to flee to France, where he died in exile. With their victory at Radcot Bridge, the 'Lords Appellant' were able to gain a short-lived control over the country. 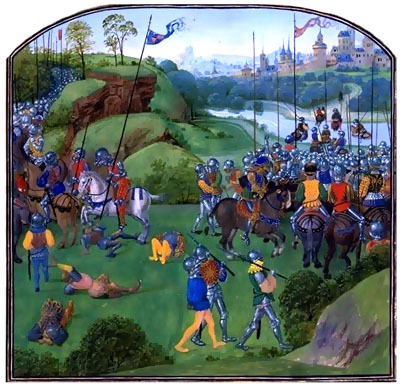 This culminated in the merciless parliament in which King Richard's main allies were condemned. It is strange that Pidnell is the more northerly of the two bridges and Radcot the southerly, while the villages are the other way round. The present Radcot Bridge, spanning the southern branch of the River Thames and the Berkshire-Oxfordshire Boundary, is of 14th century date and is therefore the one that stood during the battle. Apparently a memorial to the dead, now lost, was placed upon it in 1393.